The quality of prints from your HP D 6160 printer is great, but have you checked your ink levels recently? At some point your HP D6160 will consume all of your printer ink, and then you'll notice that buying HP D6160 ink is generally expensive. You have no reason to fret about forking out the steep asking prices you'll uncover on the high street because here at Cartridge Save you can get all the HP D 6160 cartridges you'll need at low cost. Save more money on your ink by ordering with Cartridge Save! Why waste money to buy the D-6160 original cartridge or D6160 compatible ink down the main street when it is far more simple to save a ton of cash buying online with Cartridge Save. You can have complete satisfaction when you order your PhotoSmart D6160 ink cartridges from us because they are all protected by a straight forward money back guarantee. Remember that each purchase also comes with free delivery, normally arriving on the next working day! This minimalist printer is integrated with powerful features, including an intelligent ink system and resilient hardware for large volume printing. The HP Photosmart D6160 has wireless capabilities, too, but it lacks a scanner and a copier to make it an efficient photo printer for a small office setting. This printer uses the Vivera 6-ink system and boasts an impressive rate of 31 ppm in colour and 32 ppm in monochrome. 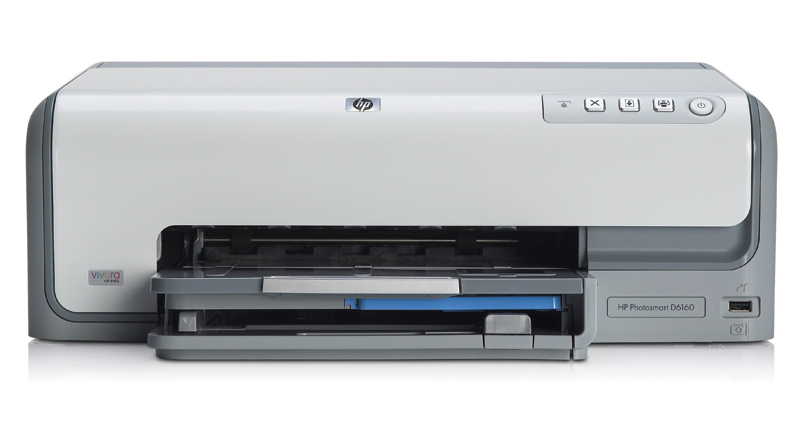 It features a user-friendly interface with an uncluttered control panel and permanent print heads, so the HP Photosmart D6160 is easier and fuss-free to install. A camera port allows direct printing from select HP cameras. PictBridge lets you print photos with ease directly from your digital camera, and send photos from your mobile phone or tablet PC via Bluetooth. During set up, the HP Photosmart D6160 gives you the option to install programs like the Customer Participation Program and Photosmart Premier image editor. Duplex printing and borderless printing are some of the other convenient features of the HP Photosmart D6160. The Bluetooth adapter does not come with the package, so you need to spend extra for it if you want to maximise wireless printing capabilities. The front camera port is practically useless if you do not own a compatible HP camera, and the absence of card readers limits the HP Photosmart D6160's direct printing capabilities on the.